Frosted Tempered Glass - Single Sink Vanities Find the a large range of Frosted Tempered Glass vanities to jazz up your bathroom remodel at Luxury Living Direct. Many selections of Frosted Tempered Glass single sink bathroom vanity sets are available at our online store. 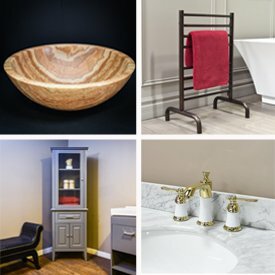 Rejuvenate your bathroom decor by mix and matching different fixtures to create a fully immersed bathroom experience. At Luxury Living Direct, we have affordable prices and great quality on Frosted Tempered Glass vanities. If you have any questions, call us direct at (800) 574-3022. Our friendly staff will be happy to assist you with any information you may require.